Did The PLA Turn Battlefield Rockets Into Anti-Aircraft Missiles? Each week fresh photos are uploaded to the Chinese military’s official news website depicting the activities conducted by each branch. These same images often seep to commentary, blog posts, mainstream news, social media accounts, and think tanks in a cycle that keeps the PLA-watching crowd nourished. But as August drew to a close a gallery of the most powerful artillery rockets deployed by China’s army revealed something unexpected. 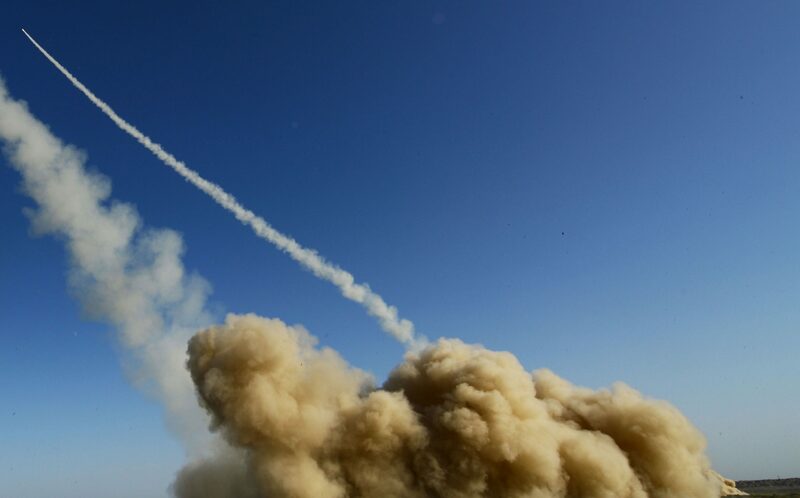 According to the PLA, an artillery brigade of PHL-03 multiple rocket launchers conducted a live fire exercise on August 20 where they attacked aerial targets. That’s correct–aerial targets! The PHL-03 is a long-range artillery platform armed with a dozen 300mm rockets whose range is estimated between 70 and 100 kilometers although its maximum range could reach 150 km. This makes it one of the deadliest conventional weapon systems in Asia and a peer to the Russian BM-30 Smerch. Since China has few qualms with exporting its missile and rocket technology, PHL-03’s have been sold to Tanzania and Pakistan. Even the US military acknowledges the destructive potential of the PHL-03 as a “conventional precision strike” weapon. The Pentagon believes PHL-03’s along China’s southeastern coasts are able to strike Taiwan. The PHL-03’s carrier vehicles are obscured by an enormous dust cloud. Via China Military Online. This month’s image gallery showing PHL-03’s in a live fire exercise didn’t explain why these were being used in an anti-aircraft role. Unless the editorial team mistranslated their own text for the photos, the descriptions accompanying these have to be taken just as seriously as a similar exercise in May. Whether or not Norinco is responsible for converting the PHL-03’s 300mm munitions into missiles is unknown but the implications of this development are quite grave. The PLA’s current air defenses reflect its evolution since the Deng Xiaoping-era. 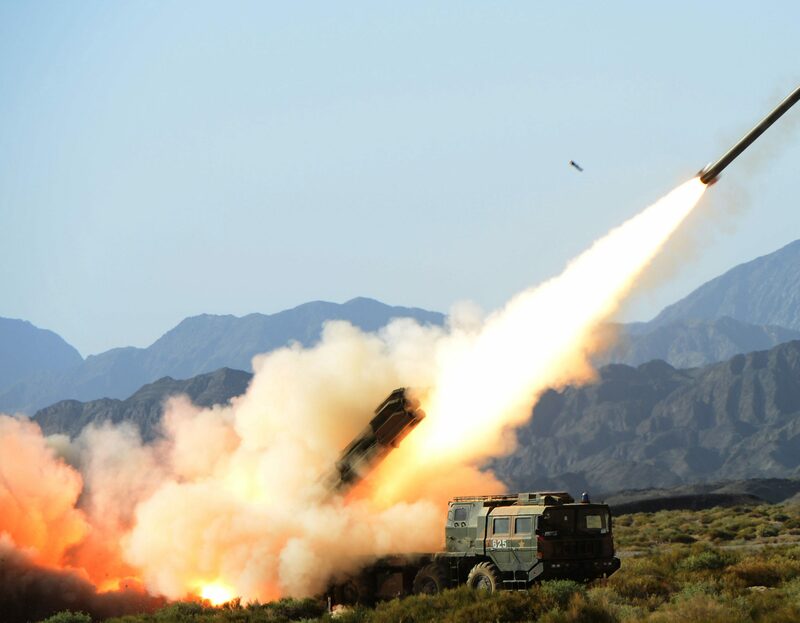 Aside from a vast array of towed and self-propelled anti-aircraft artillery, mobile air defenses are provided by short, medium, and long-range missile launchers. These begin with the HQ-7/7B for helicopters and low flying aircraft, then there are the Russian Tor and HQ-16 medium-range SAMs, and finally the aging HQ-2B/2J and newer HQ-9 for theater defense. Where the PHL-03 with its hybrid missiles fit is unclear but it’s very bad news against ground attack aircraft and missiles. The veracity of the PHL-03’s emergence as an alternate air defense system needs additional proof at this early stage. It’s such an unexpected innovation it deserves a healthy amount of skepticism. Since the PLA’s only genuine war scenario is an assault on Taiwan, with an even less likely showdown with India over Arunachal Pradesh, there are few locations where this mysterious variant of the PHL-03 is useful. Still, it’s ominous news for militaries unprepared to deal with high precision rockets.